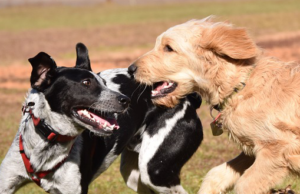 There are many owners who believe their dog is not in the mood for playing with other dogs, solely based on the fact that they never let it off leash. 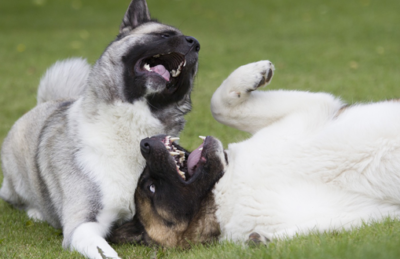 The truth is that a dog could act aggressively when leashed, but is more than happy to play with other dogs when off leash. A leashed dog that doesn’t have experience playing with other dogs is defensive and feels insecure, because it wants to protect itself and the owner from the “intruder“. Therefore, dogs should be taught from a young age. When puppies turn four months old and have received all the injections, feel free to let them play with other dogs. That is the only way for them to realise that other dogs aren’t enemies and that they shouldn’t be afraid of them. 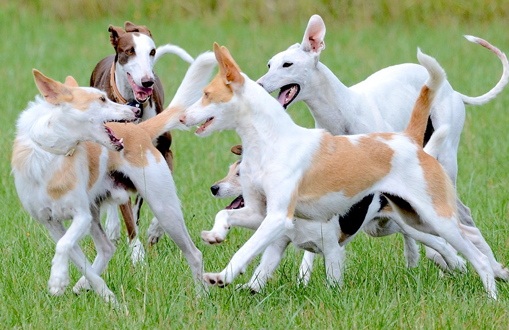 For starters, it’s enough for a puppy to play with other dogs for 10 to 20 minutes once or twice a week. At that pace, the dog will start socializing with its kind very quickly. 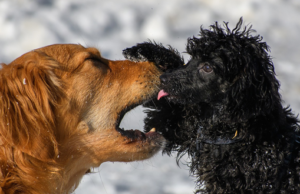 If your dog didn’t have experience with other dogs as a puppy, ask the owner of a good-natured and easy-going dog to let their dog play with yours. More away from the dogs some 50-100 meters and leave them like that without any commands. They will introduce themselves – by keeping their tails down or growling. Then they will either disperse or go on playing. The introduction moment is crucial. You shouldn’t say anything to the dog during the introduction, not even a “no“ command. At that moment, a dog could perceive any command as a sign to attack. After the initial introduction, put the leash on the dogs and take them for a little walk. Repeat this process several times with different dogs. The pet must realise that there aren’t any enemies among dogs and that it should accept all dogs as friends, regardless of whether it’s leashed or not. 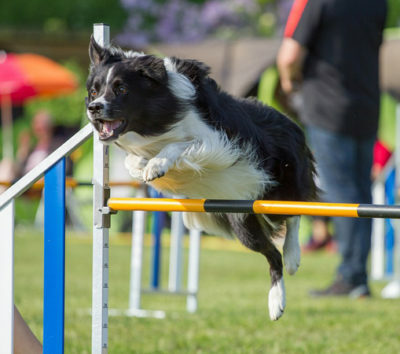 While humans perceive playing as a fun pastime, for dogs, it is a key part of socialization and plays an important role in the development of a dog.